Poem Inspires U.S. Sculptor To Honor Quake Victims A week after a massive earthquake rocked southwest China last year, NPR aired a poem called "Elegy," by Chengdu poet He Xiaozhu. One NPR listener was so inspired by the poem that he decided to make a sculpture based on it. Steve McGrew is donating a dandelion sculpture to an earthquake memorial museum in China. He was inspired by the poem "Elegy," which he heard on NPR following the earthquake in 2008. 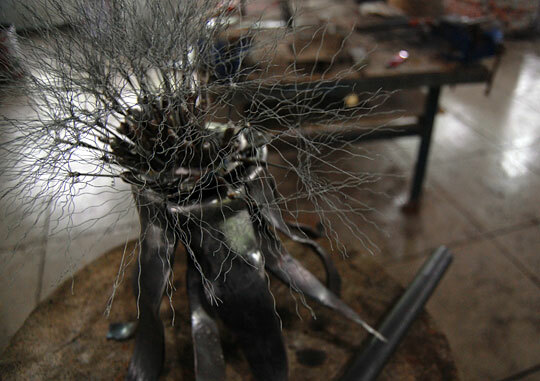 The finished silver and steel sculpture will represent a dandelion growing out of a boulder. Last year, a week after a massive earthquake rocked southwest China, we aired a poem on All Things Considered called "Elegy," by Chengdu poet He Xiaozhu. Little did we know that when we returned to Sichuan province this year, we would meet an NPR listener who was so inspired by the poem, he decided to make a sculpture based on it. Steve McGrew of Spokane, Wash., listened to "Elegy" on our Web site after his wife, Sharon, heard it on the radio. He says it brought tears to his eyes. 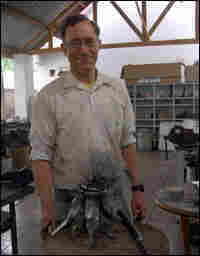 A blacksmith in his spare time, McGrew began sketching out an idea for a sculpture within an hour of hearing the poem. In his notebook is a rough pencil drawing of a dandelion emerging from a cracked boulder. Now, McGrew has taken that image and transformed it into silver and steel. He has forged a stalk, leaves and a dandelion blossom. For the seeds of the blossom, he used bicycle brake cable with the ends frayed out to look like parachutes. One of the seeds will be placed at an angle to the rest to suggest that it's blowing away. When I caught up with McGrew, he was putting the final touches on his sculpture with the help of fellow blacksmith Philip Greening Jackson, who runs the blacksmithing workshop at the Guangya School in Dujiangyan. The two met over an online forum for metalworkers. McGrew is actually an accidental blacksmith. It all started with a trip to China seven years ago with his son Ben. He tells us that on that trip, Ben discovered a sword he wanted to buy and take home with him, but the family did not have a suitcase large enough for it. So McGrew promised his son he would make him a sword when they got home. McGrew has been coming to China for business and pleasure for the past two decades and feels a strong connection to the country. He tells us the earthquake last year really hit home. He and his wife lost their own home in the Loma Prieta earthquake in Northern California in 1989. He knows the dandelion sculpture won't fix people's lives and doesn't help with any basic needs. But it does tie him to China. The sculpture will be installed at a new earthquake museum that opens in Sichuan on Tuesday, May 12, the anniversary of the quake.